Increase fraud detection accuracy in one click. SEON Intelligence is the unique and innovative way to enrich data based on a single point. Enter an email address, IP, phone number or location in the browser extension, and instantly get background information to create a complete user profile, flag fraudsters and remove suspicions. SEON’s Email Module provides the most accurate and insightful email address investigation on the market by applying deep social media profiling and domain verification tools. Aggregate social data linked to the email address to confirm identities and flag suspicious users. Check the email address creation date, user real name, domain whois database and confirm the address exists - without any blackbox algorithms. SEON Intelligence only aggregates live data, ensuring stale information and outdated databases never influence your scores. 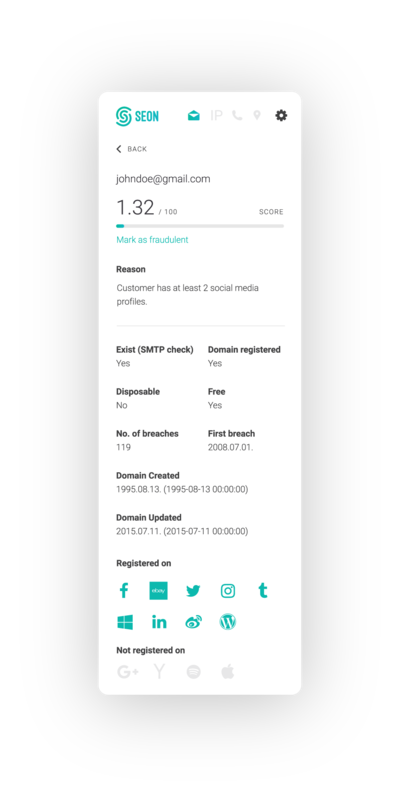 Risk scores are generated with completely accurate data, and let you block fraudulent users with adjustable thresholds. Requested data is anonymized and connections are secured via SSL. SEON doesn’t store logs or sensitive data, ensuring full data protection compliance. SEON aggregates data from open sources and databases to get a complete picture of your users and ensure accurate fraud prediction. Reduce fraud by understanding where users truly are. 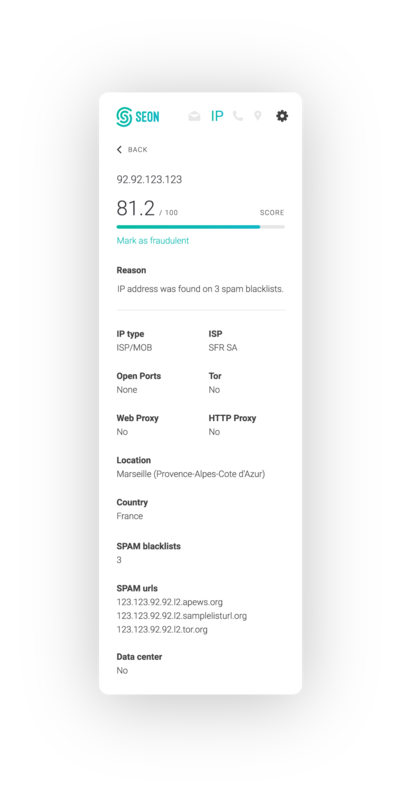 Generate risk scores based on an IP address to instantly reveal IP spoofing and masking. Confirm user location and risk based on their Internet Service Provider risk category. Block blacklisted spammers from signing up or logging onto your platform by checking on more than 60 DNSBL real time. Detect connection methods and mitigate risks associated with certain proxies, virtual private networks, or TOR browser users. Unmask users trying to connect to your service via suspicious data centers and mark them for future fraud prevention. Ping IP addresses open ports to get accurate results on proxy usage, detect malicious bots, including brute-force attackers, hijacked netblocks. Generate accurate, in-depth reports and scoring in less than 200ms to block suspicious users, flag fraudsters, and improve your business operations. Register and start your one month free trial now!